Our annual An Angel at My Table event is one of the most popular nights on the NZSA calendar. You’re invited to watch four early-stage entrepreneurs pitch to a panel of three ‘dragons’. There will be real prize money for the winners, high drama and lots of fun. As well as excellent entertainment, members of the audience get to vote for The Peoples’ Choice award! Competitors will all bring their A-game and be prepped to negotiate. You’ll see first-hand what our angels are looking for. Your entry includes a delicious two-course meal and wine tasting, plus networking with Auckland’s software community leaders, to help take your business to the next level. Last year’s Angel at My Table event was a great success and tickets sold out, so secure your seat now. 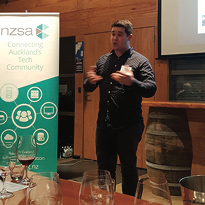 The NZSA is a great opportunity to help advance your business through meeting and networking with Auckland’s software community leaders. Plus, each event includes wine tasting and a two-course meal. Don’t forget our NZSA referral promotion: when you refer a friend or colleague to an event, you receive a free drink, and they receive a complimentary bottle of wine if they decide to join NZSA! The guest must fill in your name as the referrer when registering for a standard ticket and must not have attended a NZSA event in the past 12 months. Note: Bookings are essential as we need to have adequate seating and catering. If you have any special dietary requirements, please let us know when you order your ticket.